The Peterson family packed their bags and headed South for the family trip of a lifetime to Peru. 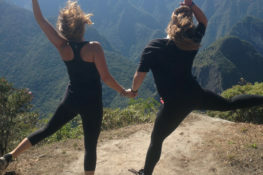 Their trip to Peru took them to the vibrant city of Cusco, the Sacred Valley, the overwhelmingly beautiful Machu Picchu, and ended with a couple of days in the Amazon Jungle. Keep reading to get a look at the Peterson family’s full Peru trip flow and photos. To scroll through even more photos take a look at the Peterson’s Great Adventure Facebook album. You will be met in your hotel lobby at 7:30 a.m. and assisted in checking in for your flight. After your short morning flight to the former Incan capital of Cusco where Andean cultures come alive (don’t be surprised when the language doesn’t sound like Spanish – it is most likely the native Andean tongue Quechua), you’ll be met at the airport and taken for lunch. Departing for the Incan sights outside Cusco, you’ll visit the fortress Sacsayhuaman and its megalithic stone terraces; Kenko, with its carved stone surfaces and subterranean altars; the Puka Pukara fortress that protected the royal capital from attacks; and the water temple, Tambo Machay. Departing from your hotel early you will head to Piuray Lake, near the village of Chinchero, which is a scenic area predominated by high-altitude indigenous farming communities typical of the area. In the lake, the kayaks and gear will be ready and after the guide ́s environmental and safety briefing, you will start our kayaking experience. Paddle according to your fitness and experience, enjoying awesome views of the Veronica and Salkantay glaciers, as well as mountains and agricultural terraces around the lake, having the opportunity to meet the fishermen and farmers doing their daily labor as well as some endemic species. After kayaking nearby to the lake stones will have been heating for around 5 hours in preparation of your pachamanca, a celebratory meal traditional in these areas. The chef will explain this tradition and the dish and you will participate in this elaborate and unique ancient preparation technique. In the afternoon you will drive and/or walk about 3 km to the community of Umasbamba, an old and beautiful hacienda populated by traditional Andean farmers and weavers, were you will learn about the Andean traditions and the magic of waist loom weaving, as well as the harvest of the dying agent plants, washing with natural soaps (roots), spinning and weaving. There is also a nice after school project at Umasbamba that you can visit after the demonstration, if time allows. From here you begin descending and pass through a traditional colonial village. After enjoying! a gourmet picnic lunch in the shadows of the Andes, continue on the downhill section to Maras where villagers still harvest the pre-Colombian terraced saltpans in the traditional way. From here you can choose to continue the descent down to the Urubamba Valley floor, hike an alternative trail, or return to the valley by van. Relax at your hotel in the evening with dinner at your leisure. Heading out early you’ll take the train along the Urubamba Valley to kilometer 104 where you’ll begin hiking the Inca Trail. Crossing a footbridge you pass Winay Wayna ruins with its extensive terracing and water fountains. Another gourmet picnic along the trail will have you refueled. Hiking a total of approximately 5 hours you finally edge along a ridge to catch your first dramatic views of the Lost City of Machu Picchu from the Sun Gate Inti Punku during the late afternoon. From here you’ll descend towards the citadel taking in the amazing site and reunite with your van that takes you down to Machu Picchu Pueblo for a relaxing evening. Early risers can watch the sunrise from the Machu Picchu citadel or make the early morning climb of Huayna Picchu Mountain. This incredibly vast archeological site – lost to the world until well into the twentieth century – is perched amongst Andean peaks and lush cloud forest making it one of the most breathtaking sights in the world. You’ll have the opportunity to get a complete guided tour of the site as you begin to unlock the mystery of the Inca, and will also have plenty of time to explore the ruins on your own. You will have lunch at the adjacent Sanctuary Lodge and be able to enjoy the rest of the day before taking a late-afternoon train back to the Sacred Valley. After your arrival in the Sacred Valley you will be transferred by vehicle to Cusco. Enjoy the day at your leisure independently exploring one of South America’s most dynamic cities. Visit Incan architectural jewels such as Korikancha – the temple of the sun, shop at Andean markets, enjoy incredible Peruvian cuisine, and see the colonial cathedrals around the Plaza Central. Or choose from optional excursions such as guided culinary explorations and cooking lessons, or an exciting whitewater rafting adventure on the exciting but safe stretches of the Urubamba River in the Sacred Valley. You will be met in your hotel lobby at 9:30 a.m. and transferred to the airport where you will be assisted in checking in for your flight to Puerto Maldonado in the Amazon. Upon arrival you will be met by a Reserva Amazonica representative and taken to their Butterfly House to go through check in procedures before going by riverboat to their lodge. Upon arrival to their lodge you will meet with a guide and chart out your excursions and time while there. For detailed excursion options please consult additional Reserva Amazonica documents. You will be transferred by Reserva Amazonica in accordance with your onward afternoon flight to Lima. Upon arrival in Lima you will be responsible for reclaiming your luggage, after which you will remain in the terminal to await your onward overnight international departure (long layovers often cannot be avoided unless spending a night in Lima due to flight schedules).